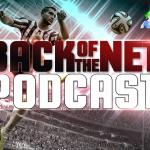 Welcome to Episode 95 of the Back of the Net: FIFA Podcast in partnership with Sweetpatch TV. This is your weekly FIFA, Sports and Banter Podcast. This week we talk about the PS4 announcement, #wishfifawouldbe, Players of the week, real life football, safety when selling your phone and we ask for your best moments of the podcasts for a compilation in episode 100. We hope you listen and enjoy.